If a clutch fails to disengage fully when the pedal is pressed, the problem may be the clutch itself. In a hydraulic clutch, however, the problem may lie in the master or slave hydraulic cylinders. Clutch master cylinder Pedal bracket Metal pipe Flexible pipe Master cylinder Release arm Pipe union Fixing bolts Clutch pedal Clevis pin Splt pin The master-cylinder pushrod isusually linked to the pedal arm bya clevis pin and split pin. The slave cylinder isusually fixed by twobolts or a clamp. 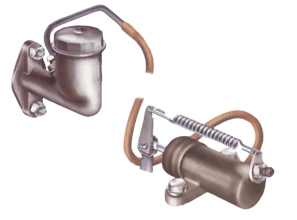 On most cars, the clutch master cylinder is a single unit with its own fluid reservoir. Worn or ill-fitting seals may allow hydraulic fluid to leak past the piston in either cylinder, so that the slave piston does not travel far enough to disengage the clutch. Any sort of leak will have the same effect and air might get into the system. If the system has air in it, the action of the pedal may feel 'spongy', whereas with other faults the pedal may feel normal, although the clutch does not work properly. If seals are worn or damaged, fit a service kit which includes new seals. The cylinder bores may have worn or become rough — hydraulic fluid is hygroscopic, absorbing moisture from the atmosphere, which can cause corrosion in the bores. In this case, fitting a new cylinder is the only remedy. Trying to smooth the bore with abrasives only makes it worse, and the roughness quickly wears out new seals. Lack of fluid is easily fixed by topping up the master-cylinder reservoir, but you still have to find out why the fluid level was low. There should be virtually no loss in normal use. Remove air from the system by bleeding it (See Bleeding a clutch). Check the entire system and repair any leaks. If you replace either a master or a slave cylinder, buy one of the same manufacture, and be absolutely sure you get the right model or an approved successor. Where clutch and brake master cylinders are side-by-side, the clutch cylinder is the one on the right, looking from the front of the car. 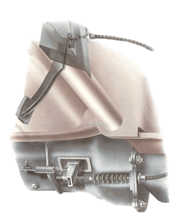 The clutch master cylinder is usually found on the bulkhead next to the brake cylinder. Usually each cylinder is directly in front of its pedal, so the clutch cylinder is the one on the right as you look from the front of the car. Brakes with servo assistance (See Replacing a master cylinder and servo unit) may have a different arrangement, but it should be clear which cylinder is which. If the clutch fluid is low, look all over both master and slave cylinders and the pipe that connects them for signs of a leak. Pull back the lip of the dust cover on both cylinders. If there is hydraulic fluid inside the cover the piston seal is worn or damaged or the cylinder may be scored. If you find a leak, remove the faulty part and overhaul or replace it. 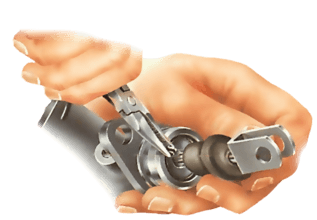 If you can find no trace of a leak, fitting a complete service kit to both cylinders may cure the trouble. If the fluid level is normal but the clutch 'drags' (will not disengage properly), and particularly if the pedal feels spongy, there is air in the system. Bleed the system (See Bleeding the clutch). Set a container to catch any fluid that runs out when you remove the cylinder, and protect paintwork with plastic sheeting or absorbent rags. Unscrew the pipe union nut to pull the pipe free. Bend the pipe as little as possible, and cover the end to keep out dirt. Unscrew the pipe union nut and lift the pipe clear, taking care not to bend or damage it. Cover the pipe end with a small plastic bag secured by a rubber band, to keep out dirt. Remove the split pin and clevis pin from the master-cylinder pushrod. If the reservoir is not integral with the cylinder, remove the reservoir cap. Put a small sheet of plastic over the mouth of the reservoir, the screw the cap back on over the plastic. This reduces fluid loss through the pipe to the cylinder by blocking the vent hole in the cap. Unscrew the union nut connecting the pipe to the cylinder. Pull the reservoir or its connecting pipe off the cylinder and quickly plug the hole in the reservoir or the end of the pipe with a small rubber bung or cork. Unscrew the fixing bolts and lift off the master cylinder. Normally the master cylinder is held to the bulkhead by two bolts, or nuts on studs. Unscrew these and lift off the cylinder. After refitting, top up with fluid and bleed the system.